This Tandem Electric Bicycle can provide you with a unique riding experience. 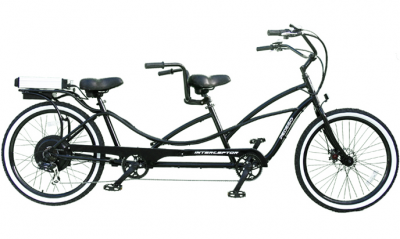 The tandem bicycle allows two to ride together (great for couples) while having all the advantages of an electric bicycle, hills and headwinds are no longer an issue with the motor ready to provide assistance when needed. The Tandem Electric Bicycle provides you with the ability to travel further distances and faster than otherwise possible, without losing your composure, nor producing any terrible noises or fumes. The 500-watt electric motor which drives the rear wheel allows you to be able to ride up hills or across broad flats smoothly and easily. The motor’s variable speed is controlled by twisting the right handlebar, the bike has 6 gears which can be operated by your thumb, allowing you to change them easily when needed. The motor is able to increase your speed by up to 20 mph, by pedaling you can increase your speed by a further 20 mph. The Tandem Electric Bicycle uses a detachable rechargeable 48 volt lithium battery to provide the power for the motor. This can provide you with a boost to your riding for up to 25 miles, though this is dependent on the weight of the two riders and on the terrain. The bicycle has an aluminum frame that has a step-through design to allow the riders to mount or dismount easily, the bicycle is able to take a combined weight of 500lbs. The bicycle has two well padded seats with adjustable suspension to help provide a comfortable journey, the 26 in. Kevlar lined balloon tires also help with this, helping to provide a soft, smooth and stable riding experience. The Tandem Electric Bicycle is a great way to get out and about with a friend or loved one. The bicycle allows you to travel further and more quickly than you could otherwise manage with pedaling alone, while still providing you with great exercise. The bicycle allows you enjoy your journeys, helping to smooth out any rough patches, like steep hills, helping you to get back into cycling, or allowing you to enjoy a day out. By using an electric motor the bicycles produces no fumes, the battery requires very little electricity to full charge making it a cost effective boost to your riding experience. The Tandem Electric Bicycle is not too expensive at a nice round $3,400.00.